Readers, friends, fellow bloggers, Mom... I'd like you all to meet Swiss Chard. She's a lovely leafy green that tastes just like spinach, only slightly heartier, and possesses the most photogenic stems I've ever seen. I've shied away from Chard in the past, burdened with a fear of all that is unknown and green after an unfortunate mishap with raw rapini. To my sweet surprise, this chard did not leave the same bitter aftertaste on my tongue that do most greens. In fact, the striking similarity to spinach had me reaching for seconds. And possibly thirds... but who's counting? 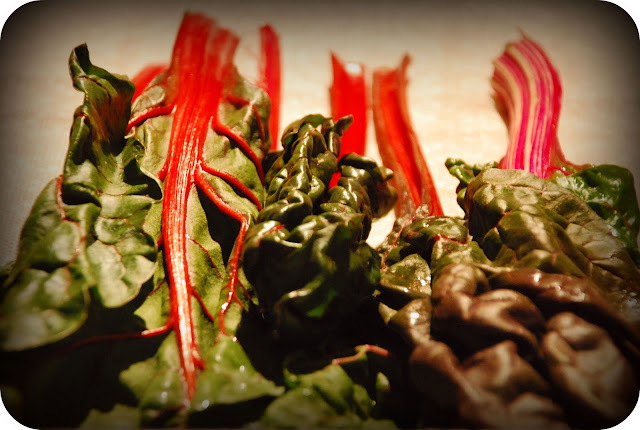 What to cook the chard with? Whatever's on hand! 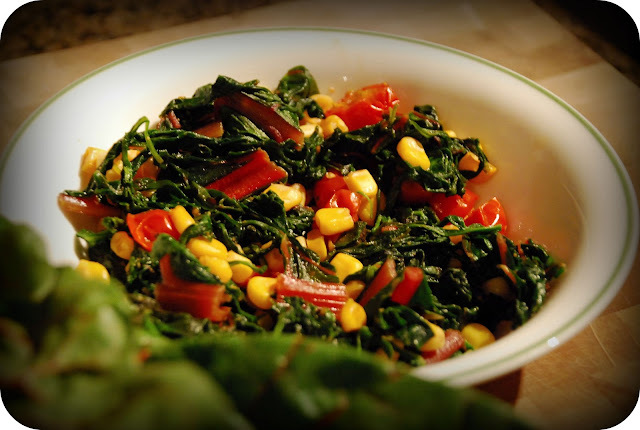 When cooking with chard, don't be shy - use the stems as well as the leaves to add a pop of colour to your dish. Use it in your favourite recipes in place of spinach, or, go ahead and make this easy entrée tonight and change up your routine! Heat oil in skillet over medium heat. Toss in arugula, chard and liquid. Once greens begin to wilt, add in corn and tomatoes, constantly moving around in pan with spatula. Sprinkle on salt, cumin and cayenne. Cook about 4 minutes on medium heat, or until tomatoes begin to blister and liquid reduces. Serve warm, optionally topped with plain non-fat greek yogourt. I was just thinking of a way to cook up some greens yesterday!! What a coincidence that you post this wonderful recipe today!